WHEN A. Winters, a Californian, needed a cooler sleeping place he built a bedroom on top of a forty-foot steel tower, up in the air where the breezes are blowing. The room is large enough for a bed, two chairs and a small table. It is reached by means of a small electric elevator through a trap door in the floor, a convenience suitable for many a two and three-story house. Records show that the temperature at the height of the sleeping room averages ten degrees cooler than on the ground and it is particularly suited for low regions where vapors and fogs lie close to the earth. The chamber makes an ideal place for reading or studying. It needs a ladder, in case something goes wrong with the lift. Also, I wouldn’t want to be up there if it got windy. Oh, come on. California never has wind storms or earthquakes and such. The chamber makes an ideal place for reading or studying … and to get away from the wife! Hope he wasn’t a sleepwalker. @ Paul – If he was he wouldn’t be for long. For all that cost and trouble…..could’nt they just put in a bigger attict fan? Or even a dedicated one for the bed room? That could be handy for an astronomy telescope housing to raise it above tree tops nest to the forest. Or at least where I’m living in currently. @Michael C: I’m not even sure if attic fans existed in 1930. They may have had ceiling fans for inside the house, but I wonder how useful they were – the one I had was a waste of electricity. Charlene » That question of when attic fans entered the picture intrigued me so I checked old Popular Mechanics. 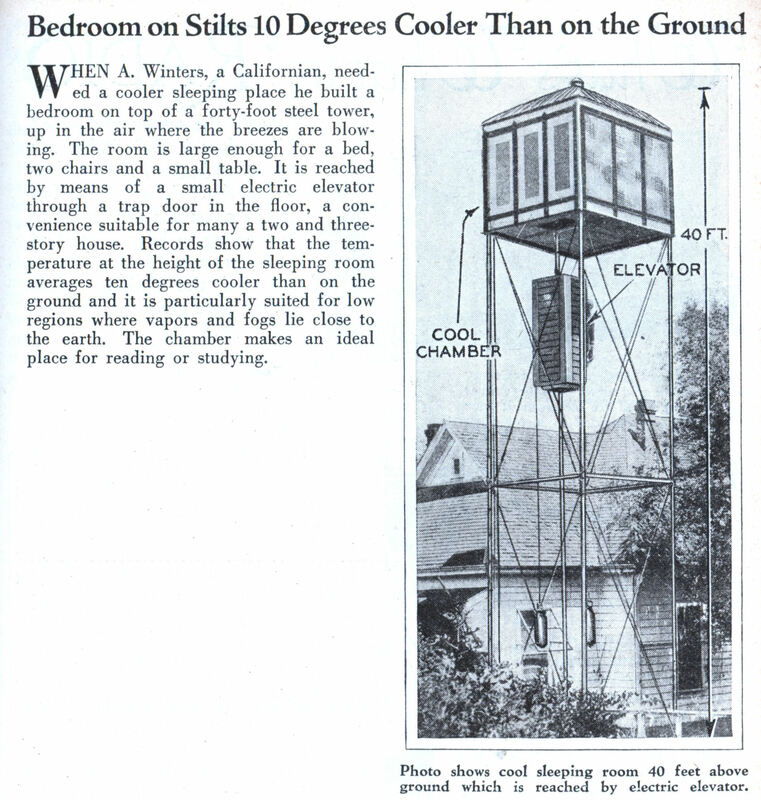 In the July 1935 issue is this suggestion to ventilate your attic with an attached fan. I think that this means that we can be pretty sure that there weren’t attic fans the way that we think about them in 1930. I’m not counting the “model electric home” on this 1923 issue since that was viewed as experimental. 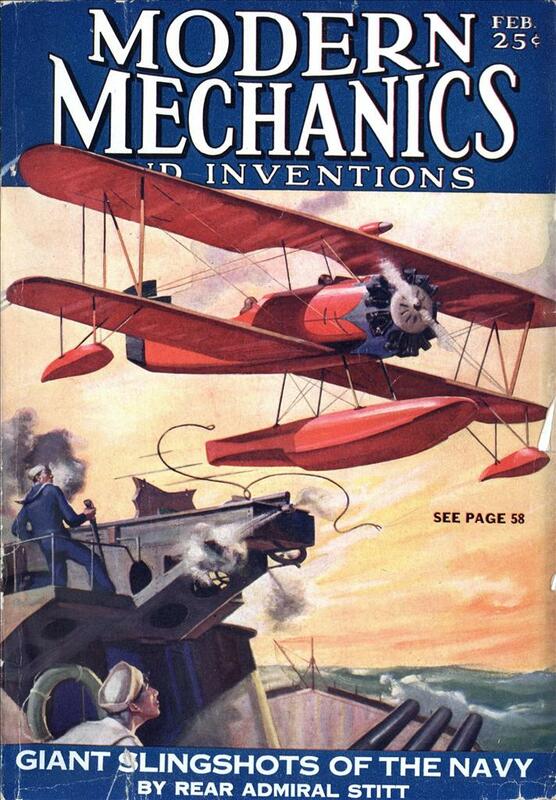 That is however the earliest occurrence of the term “attic fan” at least in Popular Mechanics. Michael C » Actually whole house fans and attic fans are two different things. Yes I know, the use of the terms has changed a little over time, or at least the slang. In my orignal post I had in my minfdthe fans my parents refered to as attic fans. They where a single big fan in the attic that pulled air in the windows and out the attic.